At Wat Plai Laem there are two fantastically ornate and detailed temples, one of which you can enter. Inside you'll find a large golden Buddha and beautiful original oil color paintings depicting various stories and events from the Buddhist scriptures. Either side of this temple are two, 40 foot statues. Happy Buddha to the left and the 18 armed Kuan Yin to the right. No one is quite sure the origin of the Happy Buddha, historically there is no actual person that fits the description. One thing is for sure this Buddha posture is a popular one amongst Thais and probably the most popular amulet purchase by tourists. We're guessing that's because, particularly in Asia, it is believed that Happy Buddha brings happiness and good fortune. It is said, if you rub Happy Buddha's belly it will bring you luck, although it would be difficult to reach this belly at 20 feet above you. The Kuan Yin statue is a beautiful sight, siting graciously with a calm and warming smile, holding various symbols in each of her hands, while wrapped in the protection of a serious looking dragon. Kaun Yin is a form of the Goddess Guan Yin and in this particular posture is portrayed as the 18 armed Goddess of Mercy. It is said, after many reincarnations Kuan Yin achieved the ultimate Buddhist goal, the state of Nirvana. Instead of accepting Nirvana, Kuan Yin decided to stay on Earth to help others in their quest to reach Nirvana. As an added bonus you can feed massive carp and catfish in the lake, feed costs 10 Baht per bag. The pigeons are partial to the fish feed too, but we are not supposed to feed them as they tend to make a mess relieving themselves as they please. The best time to visit is early in the morning before the masses arrive. 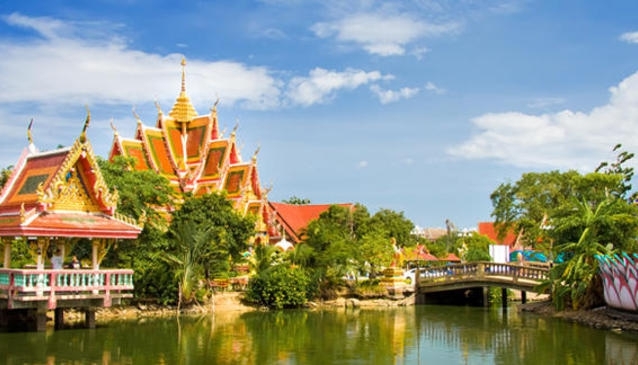 If you're planning on visiting the Big Buddha temple you can't miss Wat Plai Laem, it's only 200 metres to your left coming out of the Big Buddha temple heading towards Choeng Mon.